About the book: When Laney Carrigan's adoptive parents encourage her as an adult to seek out her birth family, her only clue is the Lokelani quilt in which she was found wrapped as an infant. Centering her search on the Big Island, she battles fears of rejection from a family that abandoned her once before while her faith struggles to embrace God's love. Along the path to her true heritage, she meets Hawaiian cowboy/helicopter pilot, Kai Barnes. Kai is determined to protect the people he's come to regard as family against a woman he suspects of being nothing more than a gold-digger, but he finds himself drawn to Laney in spite of his reservations. He's spent his entire life seeking forgiveness from past mistakes and longs for a second chance at happiness. Laney's painstaking journey to find restoration and a place to belong among the breathtaking allure of the Big Island will lead her closer to her past and maybe even something more. I so enjoy the Quilts of Love series! It is so true that quilts carry stories with them. I know now you can find quilts everywhere, manufactured in factories. The true gifts of quilts though from long ago and even today, hand made show love and comfort. 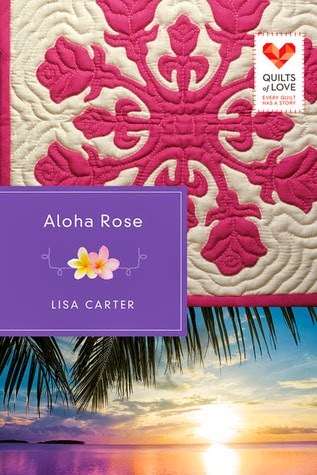 I also love having novels set in Hawaii. A girl can dream and travel at least when we have stories set in this majestic land! I have a genuine interest also in adoption and wonder about the stories of trying to find their birth parents. I know those stories can go either way though, positive or negative. I loved the focus on God and his love. Reading this book makes me want to get back into quilting! Meet the author: Lisa Carter has been published in MomSense and Christian Parenting Today. Lisa is currently teaching music at a preschool and enjoying the enthusiasm and joy for life for which preschoolers are famous. She and David have two beautiful daughters.